PLATFORMS: Apple II, Atari 400/800, Commodore 64, FM-7, PC-88, PC-98, IBM PC Jr. Protected by the gods, the Golden Fleece, legendary treasure of ancient mythology, has been kept from man for many decades. Many valiant men have attempted its recovery, but none have been successful in possessing it for any amount of time. The setting is ancient Greece and you are Ulysses. The king has requested an audience with you, to assign you the task of retrieving the Golden Fleece and returning it safely to him. On your voyages you will encounter many of the same foes dealt with by your predecessors: the wicked sirens whose beautiful songs lure unsuspecting seamen to their deaths on the island's treacherous shores, the cyclops, son of king Neptune, Pluto mythological god of the underworld, and others. Highlighting your journey is an encounter with the magnificent winged horse Pegasus. Legend acclaims Ulysses as the most daring and skilled seaman of all time. Clad in a pocketed toga and chain armor, it's up to you to prove it! 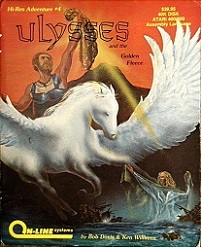 Ulysses and the Golden Fleece is the fifth Hi-Res Adventure by On-Line Systems (with Hi-Res Adv. #0: Mission Asteroid being the third), designed by Bob Davis and Ken Williams. It was the second Hi-Res Adventure that Roberta Williams was not involved with. She was also not involved with the development of Hi-Res Adv.#3: Cranston Manor, presumably because she was working on Hi-Res Adv.#5: Timezone, which would turn out to become the largest Sierra game for many years. Ulysses and the Golden Fleece was first released as an Apple II, Atari 400 and Commodore 64 game and was later also ported to the IBM PC by Jeff Stephenson. It was also re-released as a SierraVenture title in a large folder.